A company that's currently keeping its name under a guise of secrecy is one that's promising to offer a solution to one of the world's biggest issues. No, we're not talking about the Gulf oil spill, so perhaps that's a bit of an exaggeration, but we are talking about another type of gas! Farts are a serious issue, at least they are when they have the ability to make the air in a small place toxic to breathe in. Sure, you could walk around with a can of air freshener and give it a spray anytime some gas is passed. But that would just draw unwanted attention and fellow elevator riders may not appreciate you spritzing them with Hawaiian breeze or raspberry vanilla scents. 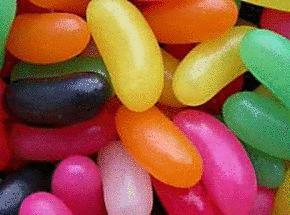 As a solution to this problem, one international perfume company has decided to create jelly beans that are safe to eat, safe to digest, and when they make an escape from your body during the process, they admit an appealing scent. This company promises that they will have jelly beans with a standard office scent, or the smell of various designer perfumes. Now we just need to wait and see exactly which business this is and if it's a concept that works! basically the stuff that you can spray on cat food so their poos don't smell but in Jelly bean form? SUPER BEAUTIFUL NINJA BOY SAYS, " EEWWWW"
Jean-Claude Van Damme is dancing wit scented farts..... WEBKINZ!! !